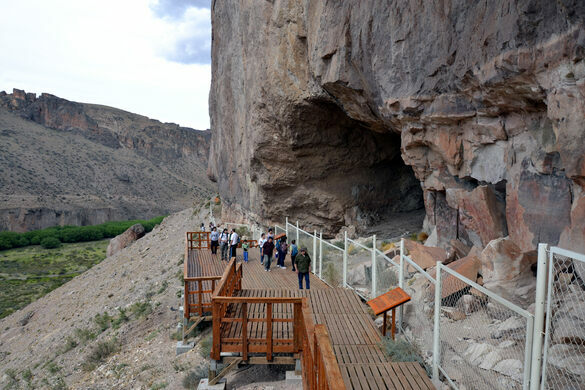 Las Cueva de las Manos is tucked in the valley of the Pinturas River, in an isolated spot of the Argentine Patagonia, accessible via long gravel dirt roads. The trip can be rough, but is undoubtably worth it: It leads you to some of the earliest known forms of human art, dating back roughly 10,000 years. Mineral springs believed to hold therapeutic properties draw in visitors from all over. Massive rock sculptures formed during the time of the dinosaurs still stand undisturbed. A vast landscape of craters from fallen meteorites. 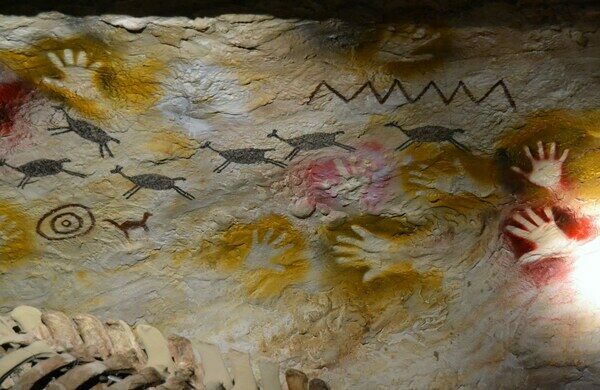 The prehistoric artwork painted on the walls of this desert cave is not only ancient, but beautiful. There are three distinct styles to be seen, believed to have been created by different peoples at different time periods. But the highlight is what gives La Cueva de las Manos, or “Cave of Hands,” its name: the hundreds of colorful handprints stencilled along the cave’s walls. The hand paintings are dated to around 5,000 BC. 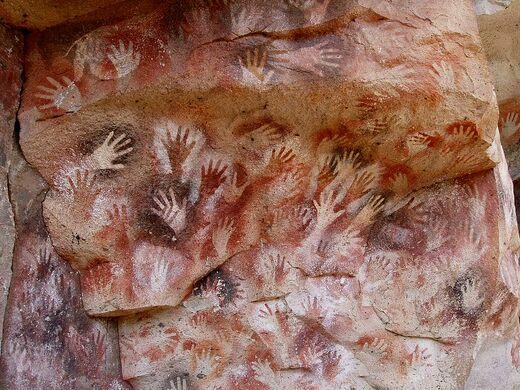 It’s believed these cave dwellers stencilled their own hands using bone-made pipes to create the silhouettes. Most of the prints are of left hands, indicating that they probably held the spraying pipe in their right hands. The artists used different mineral pigments to make different colors—iron oxides for red and purple, kaolin for white, natrojarosite for yellow, and manganese oxide for black. There are also hunting scenes and representations of animals and human life found in the cave, dating back even further than the stencilled hands, to around 7300 BC. The hunter-gatherers who lived in the caves at this time created art depicting the pursuit of prey, the most common of which was the guanaco, a type of llama. A favorite hunting tool was the bola, where interconnected cords with weights on either end were thrown to trap the legs of the animal. A third category of art was discovered, too, with paintings depicting animals and humans in a more stylized and minimalist fashion, done largely in red pigments. 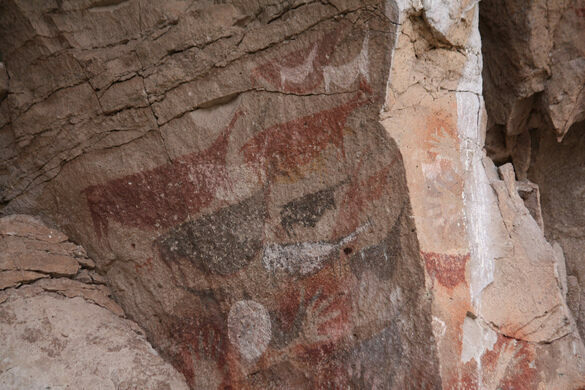 Through all these varied forms of cave art, studied layer by layer, we get a peek into the lives of those who lived in the caves, thought to have last been inhabited by the ancestors of the Tehuelche people of the Patagonian desert. It was first explored by researchers in 1949, and more extensive studies were conducted in the 1960s. It was declared a UNESCO World Heritage site in 1999. The cave lies in the valley of the Pinturas River, in an isolated spot in the Patagonian landscape. It is most easily reached by a gravel road (RP 41), which leaves Ruta 40 1.8 miles north of Bajo Caracoles and runs 28 miles northeast to the south side of the Pinturas Canyon. 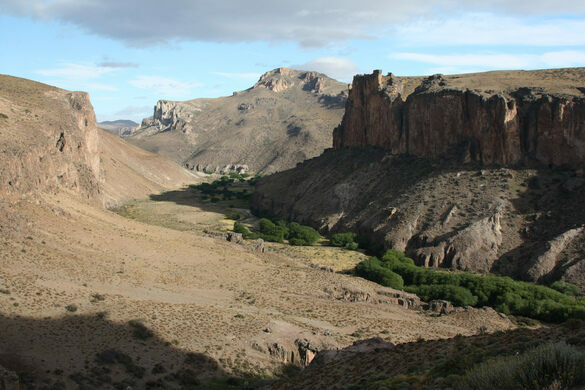 The north side of the canyon can also be reached by rough, but shorter, roads from Ruta 40. A 1.8 mile path connects the two sides of the canyon, but there is no road link. The main cave measures 79 ft in depth, with an entrance 49 ft wide, and it is initially 33 ft high. The ground inside the cave has an upward slope; inside the cave the height is reduced to no more than 7 ft. Mother Nature outdoes herself with this stunningly beautiful set of caves carved into marble. An ancient forest of the Paleocene Age turned to stone. Conifers from the Jurassic Period transformed into stone in Patagonia.